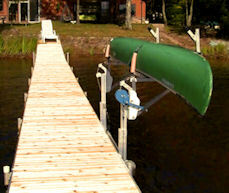 Attach a T&L mount to the side of your pier with two simple hand knobs, and you’re ready for an “L” section. Attach one on the left and one on the right for a “T.” Attach two side-by-side and you’re ready for a double-wide “L” platform. 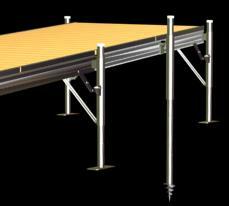 T&L mounts are made for 2.5 ft wide, 4 ft wide and 6 ft wide sections. 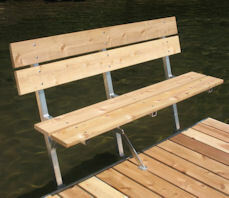 Five feet long, our bench comes in vinyl Deck or Cedar, so it’s going to match your pier. 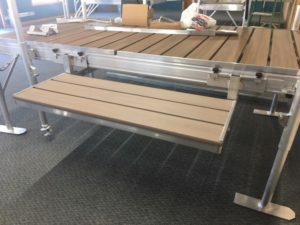 The bench also comes with or without cup holders. 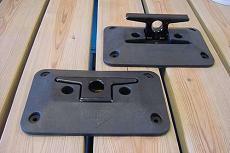 It attaches to the outside of the pier with our hand tightening grippers, leaving you plenty of deck space. 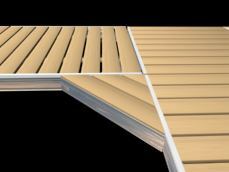 The center support-gusset hooks under the main aluminum frame through the slats of the decking for a secure feeling. 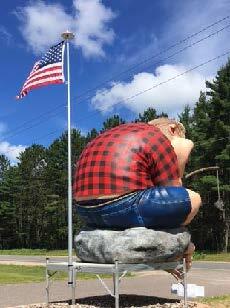 Best of all, you can face it toward the lake. How ’bout that? 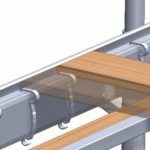 Stairsteps adjust to different depths as easily as our sections do, with two cam mechanisms. But there’s a bonus, you can vary the angle too. Make the steps vertical if you want, or almost horizontal. 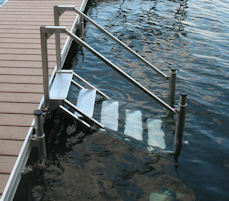 Two simple hand knobs secure the Stairsteps firmly to the dock. The corner cutter attaches from above with, you guessed it, our grippers. The guys around the shop refer to the diagonal as the hypotenuse. 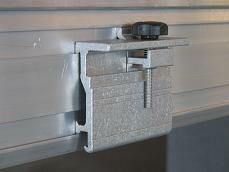 Our GRIPPER BUMPERS include hardware that attaches anywhere along the side of your pier. Our Leg Bumpers attach to the legs. That’s why we call them Leg Bumpers. They can be oriented toward the front, toward the side, or halfway in between. For water depths over about 4 – 4.5 ft we recommend our criss-cross bracing. It’s one of our cleverest accessories; you can add it after the fact, AND you won’t have to go diving to attach the bottom clamp. Our unique clamp tightens automatically AFTER you lower it to its bottom position. To see how that’s accomplished, just press one of the little buttons below. These unique cleats fold down when not in use. It’s hard to imagine a dock where that’s not a handy feature. Your toes will thank you. If you need to lock your panels to the frame, you want it to be easy and fast. Pier of d’Nort rejected dozens of schemes that weren’t easy or weren’t fast. This is the scheme that was both. One neat feature of these panel clips is that they won’t get in each other’s way when it comes to stacking your panels over the winter. The locks are staggered deliberately, for that reason. 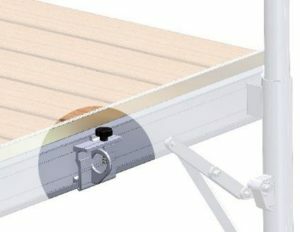 You’re now able to back your dock up against a bluff where it might be too steep or unaccommodating for other mounting methods. 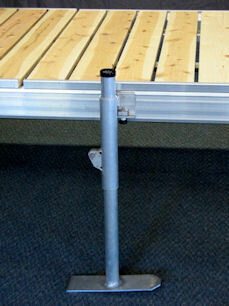 This leg can be quickly mounted anywhere along the pier. Footpads can be oriented parallel to shore if need be. 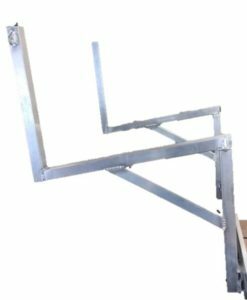 You can even bolt these legs to the side of your homemade dock and have all the advantages of a quick and secure height adjustment capability. We’d rather that you bought our pier though. 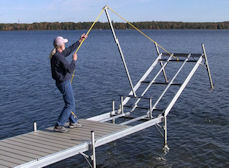 Screw the Auger Post into the ground to anchor your dock down. 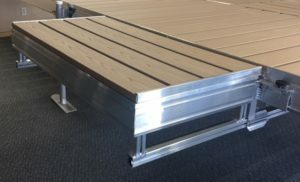 Great for docks holding larger boats on bigger waters. Also great for rivers. You can even put bumpers on them. Don’t buy them if your bottom is bedrock, they take way too long to screw in. Screw this beefy bad boy into the ground and you can tie the bow of your boat to something that’s not going to lean over. 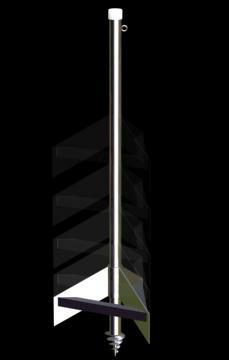 The specially designed sliding vanes dig into the substrate and provide a broad-area resistance to lateral movement. It’s an easy alternative to a boat lift. Got a really hard bottom and deep water? This item is nice for firmer substrates if you don’t want to get into the water for your first installation. It’s particularly nice if you’re installing into over-your-head water. 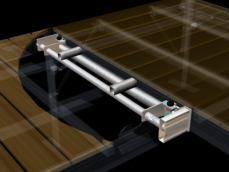 Since the spacing between boards is sometimes less than the thickness of some fingers, we thought we’d make this device. For the do-it-yourselfer we sell our gripper mounts all by themselves. Bolt or weld whatever you like to the gripper for easy attach/remove capability. It’s aluminum so it’s easy to work with. height so you can store it securely upside down. Available nowhere else. 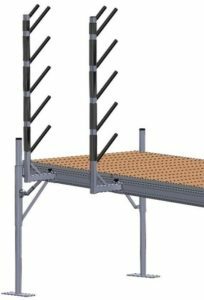 Occasionally ordinances or safety issues require the installation of handrails, so we offer them. Extends up to 20 ft tall! Comes with solid mounting hardware. 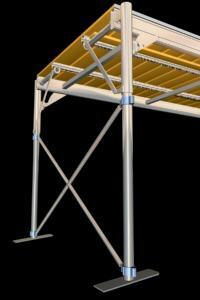 Display it anywhere on the pier where there is structural material. 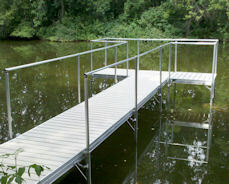 Create a space to keep ‘off pier’ or as a step between your boat and pier. Available in two sizes to meet whatever your need! 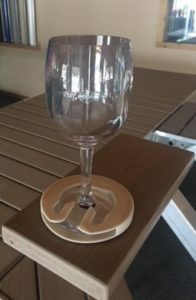 Fits snuggly inside a bench or boat cup holder!